Displaying just a message is very nice but is not very useful in most cases. Normally you need to ask the user for some more data or parameters before you can perform any real processing. Therefore in most cases the administrator script has to display a new window with input fields asking the user for some more data. In this document we present very simple examples, just an introduction so let’s ask about the administrator name before displaying a greeting. If you compare both scripts you see that they are quite similar. 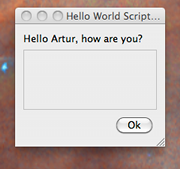 Before displaying greeting, however, the script tries to retrieve data from the name input field. 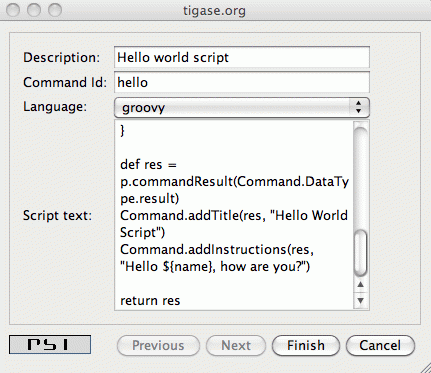 If the name had been provided the greeting is displayed, otherwise the script asks for the user name. Please note, in this case the packet sent back to the user is of type form instead of result. The practical difference is that the type result displays only OK button which when pressed doesn’t send any data to the server. The form packet displays more buttons - Finish and Cancel. Whichever you press some data is sent back to the server. This script demonstrates use of two new methods from the utility class "Command": getFieldValue and addFieldValue. The first argument to all Command methods is the packet with ad-hoc command. Next arguments sets a default value displayed to the user. The way to it is set in the example above is specific to Groovy language and is quite useful what will be apparent in later examples. After that we have to specify the field type. All field types are defined in the XEP-0004 article. The last argument specifies the field label which is displayed to the user. There are a few other different utility methods in the Command class to set different types of input fields and they will be described in details later on. To reload the script simply call "New command script" again, enter the script text and make sure you entered exactly the same command ID to replace the old script with the new one. Or of course, you can enter a new command id to create a new command and make it available on your server. When the script is loaded on the server, try to execute it. You should get a new dialog window asking for your name as in the screenshot at the beginning of this section. When you have entered your name and clicked the "Finish" button you will see another window with a greeting message along with your name.